Self-driving cars are coming to New York City, but don’t expect to see them tootling along Fifth Avenue just yet. Optimus Ride, an autonomous-car startup based in Boston, is bringing its technology to the Brooklyn Navy Yard, a 300-acre industrial park with more than 400 manufacturing businesses and 9,000 people working on site. Situated just across the East River from Manhattan, the Yard will host an unspecified number of Optimus Ride’s diminutive driverless cars, ferrying workers around the site within defined, geofenced areas. The company’s self-driving vehicle is kitted out with an array of sensors and cameras to survey the road ahead and help it find its way, and can reach speeds of up to 25 mph. Optimus Ride says it’s the first self-driving vehicle program to launch in New York state. Officials gave the nod to trials on public roads in 2017, prompting Audi and GM Cruise to apply for a permit, but strict safety stipulations appear to have so far deterred both companies from embarking on testing in the state. 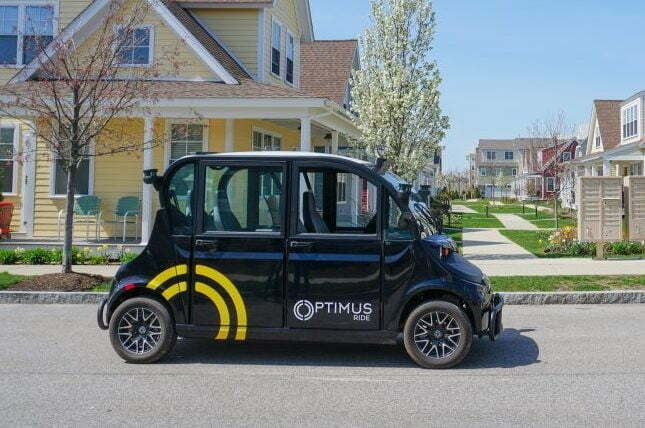 Optimus Ride’s efforts are similar to those in other parts of the country where autonomous vehicles are being deployed on private roads along fixed routes inside specific spaces such as university campuses or gated retirement communities. In fact, Optimus Ride is also launching a driverless car scheme in the grounds of an 80-acre retirement community in Fairfield, California. At both the New York and California sites, the company will offer workers and residents access to driverless rides between facilities within their respective locations. Such services are expected to become increasingly common as autonomous-vehicle companies continue to hone their technology in a bid to improve its reliability and safety across a range of driving conditions. Larger companies such as Waymo, GM Cruise, and Ford have similar plans for self-driving cars, with all three working on their own systems with an eye on the launch of large-scale robo-taxi services on regular roads. Optimus Ride was founded in 2015 by a team based at the Massachusetts Institute of Technology (MIT). The company has more than 30 years of interdisciplinary research in self‑driving technologies.